From the corners of the Curve. : BeauCoo: My new Social Media Addiction. BeauCoo: My new Social Media Addiction. Some of my most popular posts are the ones where I discuss issues surrounding body confidence. As this blog has grown, my interest for body positivity has grown with it. So when Victoria founder of BeauCoo got in touch with me a few weeks ago for me to check out a new social style network I was intrigued to say the least. As always before I responded I checked out the link she had sent me. I was directed to a page all about body positive outfit sharing. I spent a good 10 minutes meandering through and I saw so many of the bloggers I follow on IG sharing outfit posts. 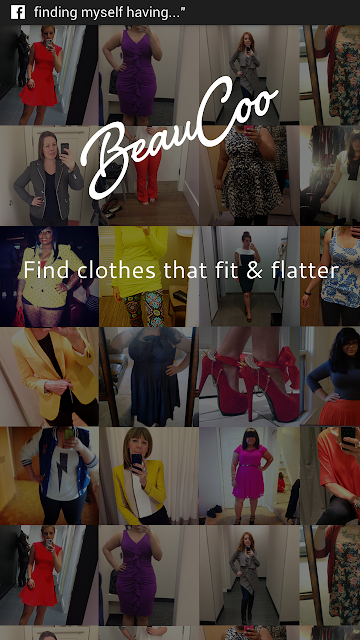 BeauCoo is a body positive community for women of ALL sizes to share outfit posts. The idea behind it is by adding your measurements at the start you are able to find other women of your size and see what they are wearing. It is always nice to see clothing on another body like yours seen as we don't get the luxury of that from the mainstream media. BeauCoo is a safe place for women to share their outfit posts, not only that but to critique the clothing. You can discuss the shape, the sizing, the length, anything! You can also see exactly where the outfit is from from a direct link to the clothing site that person has linked which makes finding that item of clothing you love so much easier. It is a place where women can feel safe in sharing their outfits without inappropriate comments from men. I know I personally have been at the receiving end of some of these comments and I am glad that this won't be happening on BeauCoo. With this being a women only site this creates a space that is just for fashion. You can search people by your size, by clothing type, heck you can search everyone but everyone on there is on there for a reason; to discuss their style. To embrace their Selfie! As well as this there is also a blog section when BeauCoo shares inspiring blog posts, I personally love this part as I am always looking to find new blogs to follow. As you can see from above those are some of my outfit posts on the site, that little pink measurement tape shows that I have entered the exact size of the clothing I am wearing, and when other ladies match with my measurements they will come a across me. So yes this is what BeauCoo is all about. Genuinely I have gotten a little obsessed with this. I've uploaded 11 posts so far and I've been following and commenting on many I just really really like it. So yeh come join me whilst I submerge myself into some more social media. I think I may have to admit I have a problem soon! If my post made no sense at all to you then do check out this video it is lovely and explains on a more in depth level about BeauCoo's mission and the people behind it. *For the interest of disclosure this post was sponsored but as always my opinions are my own.